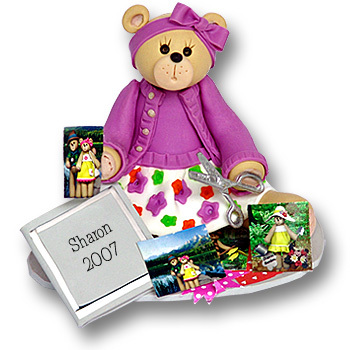 This darling little Belly Bear Scrapbooker is the perfect gift for anyone who has a passion for scrapbooking! It is wonderfully detailed and is a 3 dimensional figurine as well as an ornament and can be used as a mantel or shell decoration. She even comes complete with little photos of her last vacation. It can be personalized with the person's name on the book. It is a must have for the scrapbooking enthusiast! It is handmade from polymer clay and designed by Debi Allison. It comes complete with a hook and satin ribbon for hanging.